Facebook Tips and Tricks: No "Facebook Messenger" for Windows users ? No "Facebook Messenger" for Windows users ? 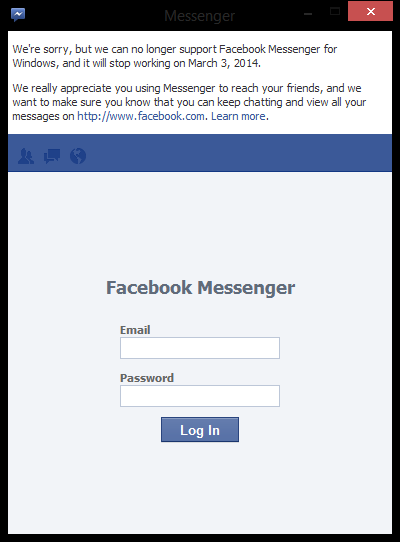 This message is seen by many Windows users who use Facebook Messenger to chat and connect with their friends. Facebook has started giving prompt notifications about its Messenger app in Windows phones, that the app will be shutting down on 3rd March, 2014 which was released in March 2012. Only Android and iOS users have the facility to continue using Facebook messenger app. When a user clicks on the "Learn More" link in the message, he gets directed to generic messages. It is stated by the Facebook spokesperson that the facility was available for Windows users just for 2 years.